Schematic procedure for using the EpiQuik DNMT1 Activity/Inhibitor Screening Assay Core Kit. DNMT1 inhibition: Recombinant DNMT1 was incubated with substrate and inhibitors. DNMT1 activity was measured in the presence or absence of inhibitors. The EpiQuik™ DNMT1 Activity/Inhibitor Screening Assay Kit is designed for screening Dnmt 1 inhibitors. 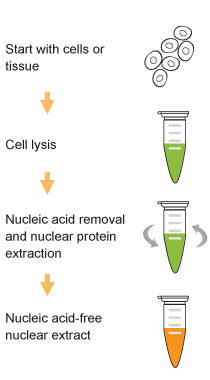 In an assay with this kit, the unique cytosine-rich DNA substrate is stably coated on the strip wells. These wells are specifically treated to have a high DNA absorption ability. A DNMT1 enzyme (not included) transfers a methyl group to cytosine from Adomet to methylate the DNA substrate. The methylated DNA can be recognized with an anti-5-methylcytosine antibody. The ratio or amount of methylated DNA, which is proportional to enzyme activity, can then be colorimetrically quantified through an ELISA-like reaction. Zhong W et. al. (September 2018). Hypermethylation of the Micro-RNA 145 Promoter Is the Key Regulator for NLRP3 Inflammasome-Induced Activation and Plaque Formation JACC: Basic to Translational Science. Yuan Z et. al. (September 2018). Tissue-specific induced DNA methyltransferase 1 (Dnmt1) in endocrine pancreas by RCAS-TVA-based somatic gene transfer system promotes β-cell proliferation. Cancer Gene Ther.